Elizabethton would probably cast its vote for TVA Credit Union Ballpark as minor league baseball’s best stadium. Johnson City’s ballpark earned the national rookie league honor Monday for the second straight season, and the Twins followed up by storming the place for 25 runs in two games and two wins. 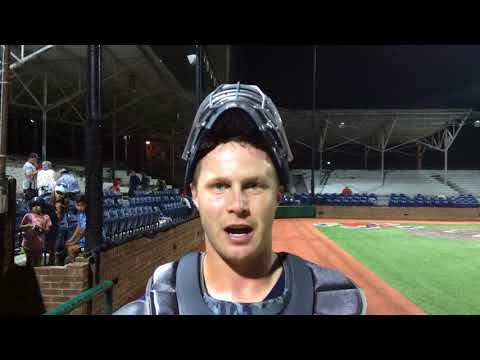 The latter victory came Wednesday night as Elizabethton earned a 10-6 decision to remain tied for first place in the West Division of the Appalachian League with Kingsport. Elizabethton, which has totaled eight homers and 33 hits in two games, improved to 12-8. The Cardinals (9-11) rallied for five ninth-inning runs to make it interesting. Leadoff hitter Lean Marrero pounded the ball opposite field off the left field wall to get the game started with a single. Yunior Severino bounced one off the center field wall to put runners on the corners. Trevor Casanova’s RBI grounder and Michael Davis’ single made it 2-0. Ryan Jeffers hit a long ball at TVA Credit Union for the second straight night. This one was a pull shot over the left field fence to make it 3-0 in the third inning. Jeffers finished 3 for 5 on the night, raising his season average to .394. Severino found a pitch to his liking in the sixth inning, hitting a three-run shot over the right-center field fence. De La Torre added to the mix with a solo blast in the seventh inning. He was one of five Twins with two hits, joining Marrero, Severino, Davis and Colton Burns. Tyler Palm (2-1) had an efficient outing, tossing five shutout innings with 78 pitches. He allowed five hits and struck out four with no walks. Johan Quezada worked three strong innings of relief. The Twins extended their lead in the fourth inning as Davis, Albie Weiss and Ricky De La Torre loaded the bases with consecutive singles. Colton Burns and Hunter Lee followed with RBI singles. With two outs, a wild pitch plated another run to make it 6-0. In the ninth, Johnson City got RBI hits from Luis Flores and Nolan Gorman, a two-run single by Carlos Soto, and an RBI double from Kevin Woodall. The Cards got their first run on Gorman’s RBI single in the seventh inning. Cards manager Roberto Espinosa said he was pleased his team kept battling. “These guys are showing good character, and we are happy to see these intangibles,” he said.